Celebrities entering the high fashion arena is becoming a common occurrence. Kanye West’s collaboration with Adidas, Yeezy, has released multiple seasons, each season selling out faster than the last. Rihanna’s collection for Puma, FENTY, just showcased its second season. Model Gigi Hadid also did a capsule collection for Tommy Hilfiger. But these aren’t like the typical celebrity brands being sold in shopping malls, targeted at the masses. Kanye, Rihanna, and Gigi’s collaborations are all being marketed as high fashion. All three of these shows were showcased during fashion week. 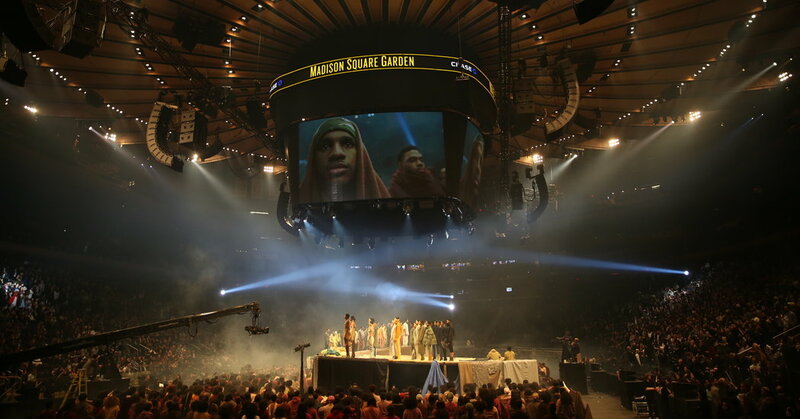 Kanye’s controversial Yeezy Season 4 was held in Roosevelt Island, garnering countless celebs and fashion’s elite. Gigi’s show, held during NY Fashion Week as well, was a spectacle to say the least. The show, a full-blown carnival theme, had A-list celebrities sitting front, fashion’s top models walking, and a huge social media presence. Rihanna’s show, however, was held during Paris Fashion Week. These celebrity’s personal styles are influencing these collections, considering many designers couldn’t get away with a collection that looked like it was chewed up by a pack of wolves before it debuted on the runway, besides Kanye West. These celebrities are also transforming these brands such as Adidas, Puma, and Tommy Hilfiger into not just popular brands, but high fashion brands. Do I agree with this, or the fact that celebrities are now becoming “high fashion” designers? Not very much, but it doesn’t matter, people are still going to buy a $800 ripped up sweatshirt from Adidas, because it was “made” by Kanye West.